With an 8.0 rating, it was a sure shot plan for this evening. And with such a star studded star cast like De Niro, Michelle Pfeiffer, Claire Danes, Pete O'Toole ... I kind of expected a lot out of this movie and frankly speaking I was kind of let down.I dont know, maybe its just me ... but I feel it could do a bit more. Claire Danes and Pfieffer could have put in a little bit more ... but thats the way I feel. Had I gone to the movie without any preconceived notions, then I would have enjoyed it a lot more. Well ... De Niro's role is enough for the paisa vasool factor. In fact, now that I think back, the casting is the one factor which has pulled the movie into the higher ratings. 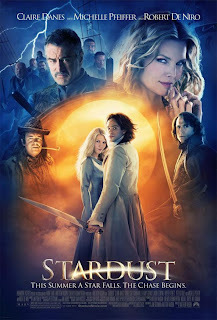 Its a fantasy movie that takes place in a magical land of Stormhold, which just so happens to share a "wall" with England. Beyond the wall in Stormhold, lies a whole different world of magic, wizardry and fantasy. Of lightning bolts that can be sold, of flying pirate ships, of unicorns and of course of witches. Enter Pfeiffer, who plays the evil sorceress poised to take Claire Dane's heart for her eternal youth. Original plot ... indeed. Theres a hopeless romantic within all of us. Its there within me, I endear it. This movie appeals to that silly person who likes the entire love-conquers-all concept. Thats why it is liked by people of all ages.